Within our household we seem to have two types of energy. Zero energy (Mummy & Daddy). And buckets of energy (toddler). Baby N is somewhere in between, he seems to have lots when he wakes up and it slowly dwindles. Unlike N & J, Daddy & I wake up with zero energy, even after a full nights sleep. Daddy works 8 hours a day and then comes home and helps look after the boys. I look after the boys all day, try to fit in housework & chores where I can, then do even more when Daddy gets home. We’re pretty much always on the go (albeit slowly) until J goes to bed, and even copious amounts of caffeine & sugar don’t help. J. Now J, as I said above, has ab-so-lute-ly buckets of energy. There’s only one explanation. 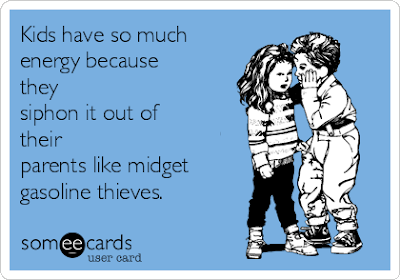 He is an energy thief. It’s not often we do crafts or anything fun like that, as even when he finds something he enjoys, he won’t sit still for longer than two minutes. The only time he does is when he’s eating! Mind you, if he’s not strapped in his booster seat at the table he doesn’t sit still to eat… Even when he’s worn himself out from running around all day, it gets to bedtime and he will start running around in circles. This is to keep himself awake. How does he still have the energy?! He doesn’t nap so it doesn’t come from there.